The library's web site has a fresh new look, just in time for the fall semester. We hope you'll find our new web site easy to use, and we'd love to get your feedback on this brief 5-minute survey. UPDATE: This issue has now been resolved. There is a problem with our Journals List not showing the locations and holdings for our print and online journals. We hope the vendor resolves the problem shortly. If you need assistance in the meantime, please contact the UFV Library. Several Proquest products will be unavailable due to system maintenance on August 18/18. Proquest e-books have a maintenance downtime Sat. Aug. 18 from 9:00 am - 2:00 pm, and Proquest databases have a downtime Sat. Aug 18 from 7:00 pm to Sun. Aug. 19th 3 am. Printing has been restored on the Chilliwack campus. Student printing is unavailable on the Chilliwack campus in the library and computer lab. IT Services is working on a solution. We will update when more information is available. November 26th at 2:30pm, join Art of the Book artist Helen O'Connor for a paper-making workshop in the Abbotsford library. Click here for details. December 6th at 3pm, join Art of the Book juror Jan Elsted for a personal exploration of the Art of the Book in the Abbotsford library. Click here for details. 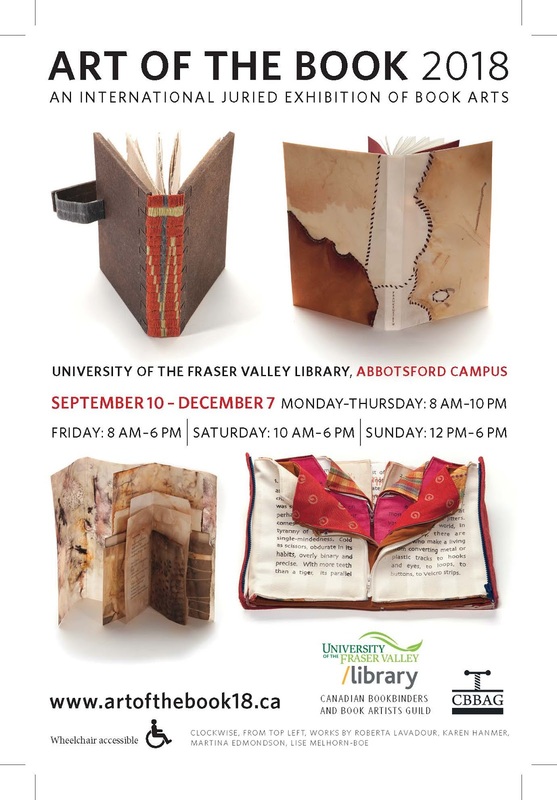 The University of the Fraser Valley library, located in Abbotsford, BC, is very proud to be hosting the 2018 Art of the Book exhibition from September 10th to December 7th. We are the sole host site in the Lower Mainland. The Art of the Book is an international juried exhibition of the Canadian Bookbinders and Book Artists Guild (CBBAG). The exhibit opens in Victoria in August, and will be traveling for two years across Canada. Take a look at our research guide (Libguide) on the Art of the Book here. You'll find some great resources on the book arts and related disciplines. Also, you'll find links to online book arts collections and altered book projects. Enjoy the ChekNews piece on the Art of the Book opening at the University of Victoria. UFV's student newspaper, the Cascade, has written an article about the exhibit. Enjoy some photos of the reception held on September 18th celebrating the opening of the exhibition. If you are coming from either East or West, the best way to get to the UFV Abbotsford campus is on Highway 1. Take exit 90 for McCallum Road; follow the King Connector to King Road; turn left onto King Road; UFV will be on the right. If you are traveling from Washington State, take I-5 N to WA-539 N/Guide Meridian/Meridian St in Bellingham; head North on WA-539, then right (East) on WA-546 which becomes WA-9 to the Sumas Border crossing. Head North on Hwy 11 (Sumas Way); turn left on Vye Road; turn right onto McKenzie Road; entrances to the Abbotsford campus are on the left, before you reach King Road. The library is located in building G on campus. Visitors to our campus can find information about parking and the library's location here. Library hours can be found by clicking here. Tourism Abbotsford has information about places to stay in the area. One of the closest hotels to the Abbotsford campus is the Best Western Plus - Regency Inn & Conference Centre located on Marshall Road.